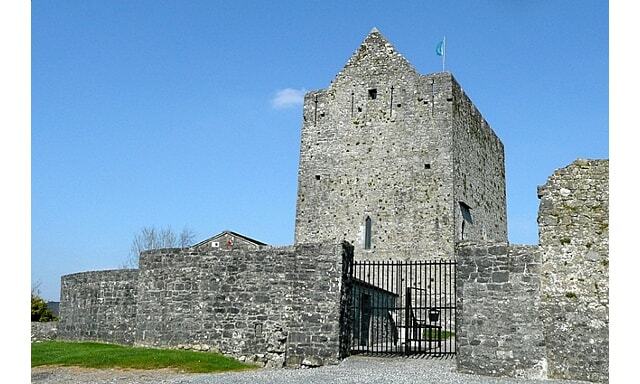 Athenry Castle is a tower house and National Monument of Irleand. Despite being locally known as King John's Castle or King John's Court (after the Lord of Ireland 1177-1216), it wasn't built until twenty years after his reign. Athenry Castle is a large rectangular building with base-batter, originally containing only a hall on the upper level and storerooms at ground level. The battlements are 13th century with tall arrowslits in the merlons. In the 15th century, these parapets were incorporated into gables at the north and south ends for a new roof. Parts of the original enclosure wall of the castle survive.